580 pages | 5 Color Illus. | 16 B/W Illus. The text provides a lifespan developmental approach to neuropsychology. It addresses the many issues in neuropsychological assessment that differ between younger and older adults. It describes the symptoms, neuropathology, diagnostic considerations, and treatment options of common neurological disorders associated with aging. 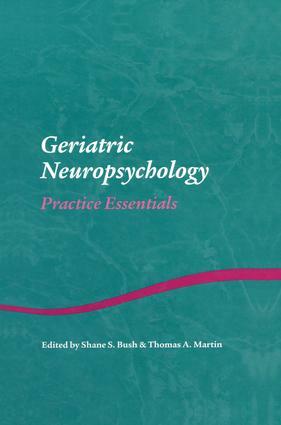 It also addresses special considerations related to geriatric neuropsychology, such as ethical issues, family systems issues, decision-making capacity, cultural consideration, and medical/medication/substance use issues. Additionally, a list of resources for the elderly and their families is also provided. "This carefully edited book provides the clinician and researcher with a balanced and comprehensive perspective of neuropsychology for the elderly. Respected experts have consistently bridged the scientific findings of their specialty with clinical applications. The book will serve as a useful resource for guiding both clinicians and researchers to select specific neurocognitive and psychodiagnostic measures tailored to diagnosing the elderly. I strongly recommend this book to all clinicians, researchers and student in the field of gerontology. This is not only the most comprehensive resource book on the elderly, but since we all face a decline due to aging, I especially appreciated the tone throughout the book that honors the elderly for the richness of their experiences and wisdom.